Becoming Picasso: Paris 1901 is an exhibition with laser-sharp focus, exploring Picasso’s development as an artist in 1901, a vital year in which the painter had his breakthrough in the Paris art scene and began his famous Blue Period. The first section of the exhibition is a collection of paintings created by Picasso for his first Paris show at the gallery of influential art dealer Ambroise Vollard. With only one month to prepare enough work for the Vollard show, Picasso worked at a frenetic pace, creating such vigorous, colourful paintings as Dwarf Dancer and At the Moulin Rouge, attempting to reinvent the styles made famous by such French artists as Degas and Toulouse-Lautrec. Nowhere is the young painter’s sense of confidence more apparent than in I – Picasso, an energetically-textured self portrait in which Picasso stands out in fiery colour against a dark backdrop, staring out at the viewer as if to announce his arrival in Paris as a talent to be reckoned with. While Picasso’s turn at the Vollard gallery was a commercial success, the artist was destitute by the end of 1901 following a less lucrative series of paintings which marked the beginning of his Blue Period. The second section of the Courtauld exhibition focuses on this time, featuring works created by Picasso while grieving the suicide of his friend Carles Casagemas. The mood becomes more melancholic and emotionally challenging, and the energetic, loose brushwork favoured in Picasso’s earlier work is abandoned in favour of bold outlines and expanses of simplified colour. 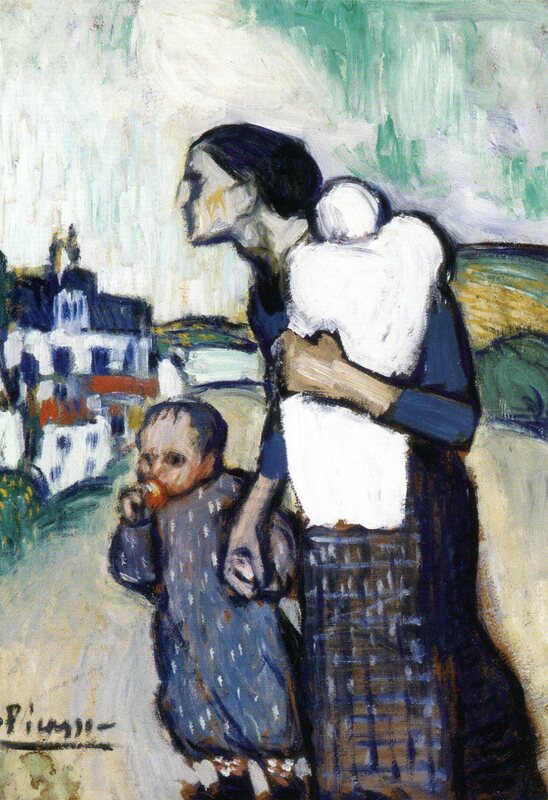 Paintings such as The Mother and Absinthe Drinker convey a sense of poverty and isolation which is in stark contrast to the ebullient tone of Picasso’s earlier works, and the exaggerated bodies and hardened composition of pieces such as Harlequin and Companion foreshadow the artist’s later Cubist masterpieces. With only 18 paintings in this show, it is a triumph of successful editing. Every work contributes to telling the story of this important year in Picasso’s development from a young prodigy to an artist of enduring importance. This exhibition is open until 27 May.